Once the call for applicants is closed, an administrative eligibility check is conducted. Afterwards, the selection process for candidates will be two-fold. 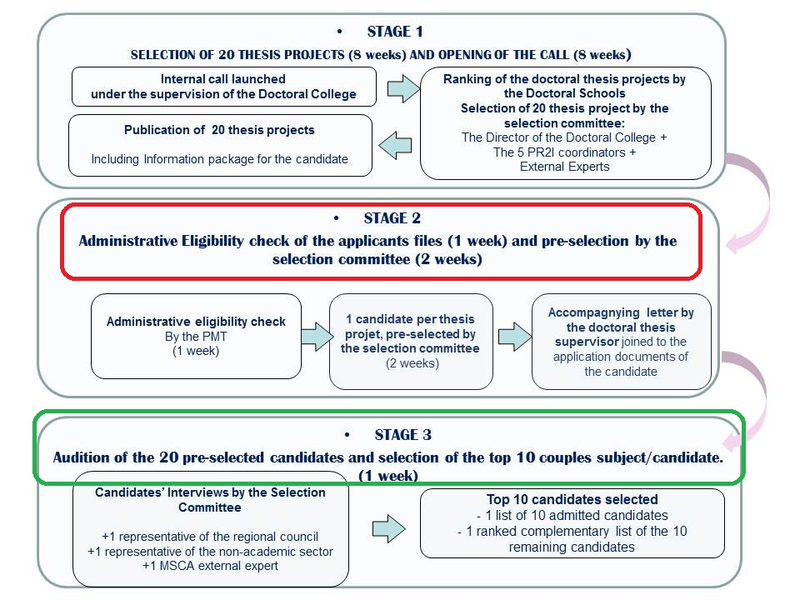 The selection committee, composed of the Director of the Doctoral College, the coordinators of the PR2I and 6 external experts, will carry out a preliminary evaluation of applicants and will select and support 1 candidate per thesis project, taking into account the doctoral supervisor’s assessment of the candidates’ quality. This stage 2 is highlighted in red in the figure below. Each doctoral supervisor will prepare a letter of introduction on the selected applicant that will be added to the candidate application documents for the next and final stage of the selection process. For the final selection stage, the committee gathers its members with additional members: 1 representative of the Regional Council, 1 representative of the non-academic partners, 1 external expert selected for his/her knowledge of the MSCA and the COFUND projects and the EPM. The Final Selection Committee will have at its disposal the complete application documents of the applicants and the accompanying letter from the doctoral supervisor. The candidates will be invited for an interview during face-to-face meetings with the committee if feasible, or per video-conferencing. Financial resources are planned to ensure a 2 days stay of the candidates who have the possibility to come to AMU. This stage 3 is highlighted in green in the figure below. Based on the scientific quality of the doctoral thesis topics, on the correspondence between candidates’ profiles and the doctoral thesis subject, and candidate’s motivation, the committee will select the candidates taking into account the accompanying letter from the doctoral supervisor. The rejected applicants will be ranked in a complementary list and will receive a detailed evaluation on their application. Rejected applicants can be contacted in the case where a selected applicant renounces the position. At every stage of the selection process, the candidates will be informed on the status of their file, and will receive an Evaluation Summary Report if they fail in a selection stage, detailing their strengths and/or weaknesses. They will be entitled to initiate a redress procedure as stated by the national law if they contest the recruitment procedure. The redress procedure is detailed in a downloadable PDF file, found at the bottom of this page. Eligible candidates will receive an acknowledgement when they pass a selection phase. The European Project Manager (EPM) will be available to answer the queries of the candidates through email or telephone. Candidates are invited to read the Guidelines for Evaluators, available on this site, to acknowledge the instructions provided to evaluators at every stage of the selection process.